T-Mobile US detailed plans to deploy a rebranded version of its Layer3 TV service in eight markets, ahead of the launch of a mobile TV product later this year. 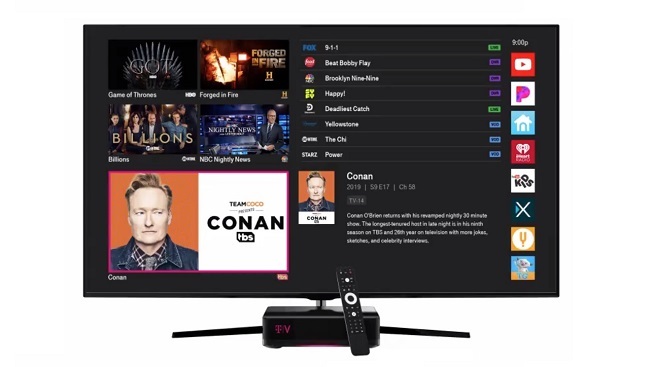 The TVision Home service will cost $100 per month for a set-top box and access to 150 channels, local broadcasts and regional sports, with premium channels including HBO and Starz available for an extra fee. Streaming apps from Pandora, iHeartRadio and a handful of others will be available at launch, but T-Mobile said apps from big name video services including Netflix, YouTube and Amazon Prime Video are “coming soon”. Amazon Alexa and Google Assistant are incorporated, as is compatibility with smart home devices including Nest security cameras. In a statement, T-Mobile COO Mike Sievert branded the offer “TV built for the 5G era”. Service will be available in Chicago, Dallas, Los Angeles, New York, Philadephia, San Francisco, Washington DC, and Longmont, Colorado from 14 April. Sceptics noted the TVision Home proposition looks and costs much the same as a typical cable bundle. But T-Mobile defended, noting it is the beginning of a push to challenge the cable industry with a service compatible “with the apps and hardware and services people already use”. It plans to launch the service on third-party platforms in the future to eliminate the need for its own set-top box. Additionally, it reiterated plans to launch a nationwide mobile TV service later in 2019. In a research note, Wells Fargo Securities analysts said while the mobile service will pitch T-Mobile into an “increasingly crowded field” of streaming services, it could potentially find success by tapping its “loyal wireless customer base”. The investment bank added it doesn’t believe T-Mobile will back away from its TV ambitions if a proposed merger with Sprint fails, pointing out the operator acquired Layer3 TV well before it announced the tie up.